Posted April 11, 2013, in Featured Publication. 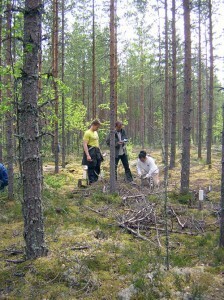 Impacts of forest post thinning residues on soil chemistry, fauna and roots: Implications of residue removal in Finland. In a study of post-harvest residue management in Finland, aboveground tree biomass production was significantly higher with higher levels of post-harvest residue retention. Changes in soil chemistry and fine root biomass were minimal, but specific root length and ectomycorrhizal root tip abundance showed significant increases in the highest residue addition compared to the no-addition control. Abundance of small enchytraeids increased with residue retention, but there was no effect on soil nematodes or soil arthropods. Page last updated by Department of Biology at 12:04 pm April 30, 2013 . This page was printed from http://biology.camden.rutgers.edu/2013/04/11/john-dighton-2/ at 7:09 AM Sunday, April 21, 2019.